Fed up with our family meetings on the topic “What Do We Want To Eat For Dinner This Week?”, my husband prepared a list of 71 dishes he could easily cook. It’s an impressive list, containing everything from cottage pie to broccoli-cheese soup to lasagna. My own list would be about 30 items, tops. Then we ask Alexa for a random number between 1 and 71. Whatever number she arrives on, that’s what we eat. This week, Alexa gave us no. 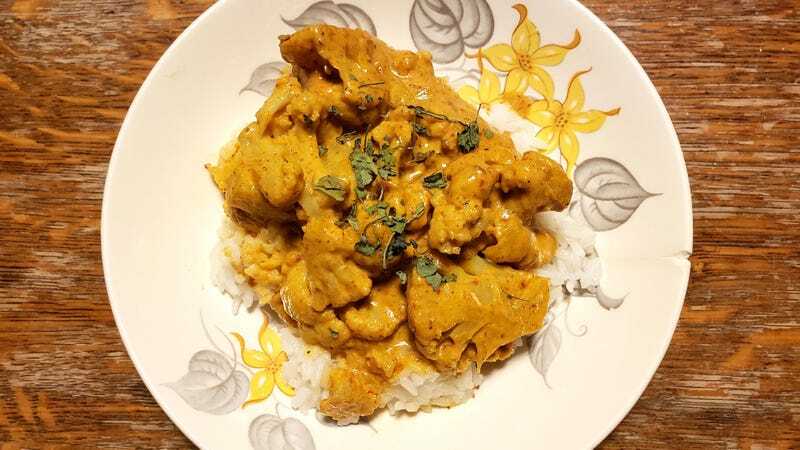 37, or chicken jalfrezi (base of Brian’s famed fourth-place chili); he decided to add yellow curry cauliflower and jasmine rice. Since we had so much food, we invited some neighbors over as well. Sorry, jalfrezi, but the yellow curry turned out to be the star of the show. The jalfrezi was great, but the yellow curry spoke to something long-neglected in my soul. I think my son and I would have licked the pan. I asked Brian what was in this addictive dish, and his answer was so simple I had to share it as soon as possible. Sure, something based in coconut milk has a huge head-start in the deliciousness department, but all the additions complement the cauliflower significantly. It may become your new favorite vegetable dish. So cook up this cauliflower curry as a delicious side dish or an entire Meatless Monday dinner (does fish sauce disqualify it? ), and praise my name—or rather, Brian’s—later. Cut cauliflower florettes into bite size pieces, ensuring at least one side is flat. Heat large skillet on medium-high flame and add oil. When oil is hot, add cauliflower pieces, arranging them flat-side down. Let cauliflower cook, rotating until all flat sides have a nice color. Add in fish sauce and sauté cauliflower for 30 more seconds, then remove from pan, setting aside on plate. Lower the pan’s heat to medium and add in about 1/4 of coconut milk, stirring occasionally. When coconut milk begins to thicken, add curry paste, stirring into the coconut milk. Allow the mixture to simmer for a few minutes. Add remainder of coconut milk and sugar, stirring until fully incorporated. Add back in cauliflower and stir and coat all the pieces. Cook until coconut milk begins to bubble and thicken. Take off flame and serve over with rice.